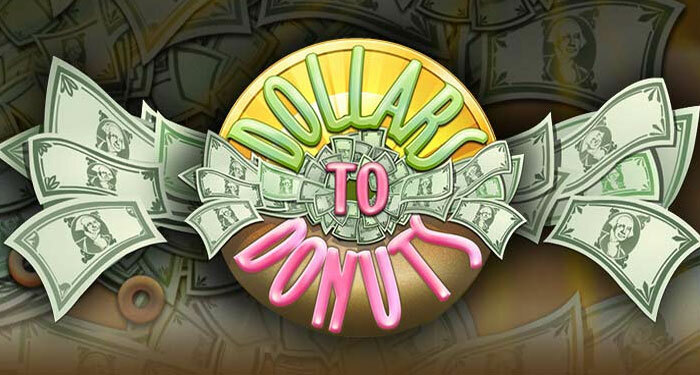 Coming soon to the Online Casino world at Desert Nights Casino- Dollars to Donuts! Sit back and relax with a hot cup of coffee while you enjoy all the Donuts you can imagine on this fun and entertaining Slot. Dollars to Donuts is a classic styled slot with exactly 3 reels and 5 paylines. This slot was created by Rival Games for all the sweet tooth people out there. Featured on the reels are bars, 7s and some yummy looking donuts and lots of them. The donut you need to look for to increase your win would be the pink donut so keep your eyes glued to the screen for that donut. When you get 2 or 3 pink donuts on a line credits are awarded with these matching symbols in the payline. The logo is also on the reels which is used as the Wild Symbol of the game. This classically sweet and delicious game has more to it than just 3 reels and a few 7s, The Slot also has multiple symbols that payout, multipliers and Free Spins! Even for a simple game it will still pay out well and you will be so entertained by trying to get those yummy pink Donuts! Players can choose to play from 1-3 coins per 5 paylines plus more values. In this game there aren’t any bonus games offered but there is however 11 different winning combinations. The highest paying win you can get is 3000X your bet. This only pays out if you line 3 pink dollars to donuts symbols betting the max which is 3 coins. Play today and join the craze, because everyone is going Do-Nuts about this Slot! Launch Date: February 22, 2017 mark it in your diary and save the date for this new slot. You don’t want to miss this sweet lunch date, I mean Launch date. Come on and spin watch the reels go round and cross your fingers for the scrumptious pink donut!